The Registered Master Builders Apprentice of the Year, in association with CARTERS, is the leading apprentice competition for the building and construction sector. 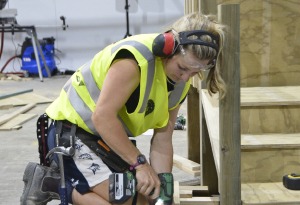 The competition recognises excellence among carpentry apprentices and raises awareness of career opportunities in the building and construction industry. It also celebrates you, as employers, for investing in apprentices and giving back to the industry. It showcases the benefits to your business of mentoring the sector’s future leaders. Registered Master Builders have listened to your feedback, and in 2018 we have introduced an award for employers who have had an apprentice win three regional titles, and a practical component at the regional competitions. Apprentice of the Year is a great opportunity to recognise the industry’s most talented apprentices and celebrate you, their employers, who are supporting and growing New Zealand’s construction industry. If your apprentice wins their region you would receive a free ticket to the national awards in Auckland and one nights accomodation inc breakfast. If your apprentice wins the national final you would receive an employer award of an Apple iPad care of Ministry of Business, Innovation and Employment and a $300 travel voucher care of House of Travel Lakers. “It’s great for me as an employer to have an apprentice in the competition. There is a huge amount of publicity around the competition which is great for our company’s recognition.” – Neil Hunt, employer of 2017 Apprentice of the Year finalist Olivia Ward. Rob Pedersen – McMillan and Lockwood. Employer of 2016 Apprentice of the Year Callum Bryson. Rob says that when he has a team member like Callum whose potential is evident, he has no qualms about providing the opportunity to step up. Rob said the project Callum submitted for Apprentice of the Year was a particularly challenging one. The work was highly complex and the site was 100km from the support of home base. Russell Campbell – Inhaus Developments Limited. Employer and father of 2015 Apprentice of the Year Shaun Campbell. Russell says 20-year old Shaun made up for what he lacks in life experience with an absolute passion for building – which he demonstrated from a very young age – and a real pride in what he does. Russell says that he was particularly impressed by the support from the Apprentice of the Year sponsors, which meant that there was very little cost involved for employers. He encourages other employers to support their apprentices to enter – he’ll definitely be suggesting his other apprentice gives it a shot. Russell Clarke – Licensed Renovations. Employer of 2014 Auckland Apprentice of the Year Cody Webby. Russell says he encourages his apprentices to enter Apprentice of the Year because it’s good for his business, and it’s good for the apprentices. Russell’s company has been involved with the competition for a number of years. Cody is a great example of the positive impact the competition can have on an apprentice. He is now really thinking about where he wants to be, and what the building industry is going to look like in 10, 20 and 50 years. Ben Redmond – Redmond Builders Limited. Employer of the Registered Master Builders 2013 Apprentice of the Year. Ben says the bottom line is that there aren’t any downsides to supporting your apprentices to be their best. When your apprentice succeeds, so does your business. Who wouldn’t want a top class tradesman to work alongside every day? Cameron Isles – Isles Construction. Employer of 2017 Apprentice of the Year finalist Atigiapa "Tingi" Meyrick. We have had an apprentice in Apprentice of the Year for the last nine years, so we have a long history of entering apprentices. Our company gets a lot of recognition locally and our clients are always impressed with the quality of work from them. The time that apprentices need to take off work is very limited – there is not much of a challenge in allowing them the time off the enter the competition. A lot of the competition is based around what they do on their current work sites.